God speaks and answers prayers! I know for many of you Christian mommies who stop by my blog the above statement is no surprise, but I feel like it's been a while since God and I were in synch. Have you ever had a period in your life like that? Now, like many of you, I grew up in a Christian home. I've been praying for as long as I can remember. We had Christian music in the house and watched Christian programs. We went to church regularly, and sometimes it seemed there were a lot of rules connected to a lot of those things...the prayer, the church, the Christian upbringing. This is a whole other story all together, but I've strayed WAY off the path at times in my life, and have come back and have strayed and have come back...because I'm human and sometimes don't like rules...because I'm human and was a teenager and really didn't like rules...and despite the fact that I'm human God seems to love me and keep nudging me along in the right direction, and for that I'm so very grateful. Anyway, my straying lately has not necessarily been outward rebellion of any sort...it's been one of those periods where I have have just not been diligent at many things I should be doing to keep a healthy spiritual walk: I haven't been praying, like real, all out, time with God praying...I send many mini SOS's up to God throughout the course of the day ("God, please let the girls sleep," "God, please give me the strength," "God, how am I going to get through this? "), but I haven't really spent solid time listening, or diligently praying about so many things that are going on in my life, nor have I been reading my Bible like I should, and I've been feeling the ramifications of it. For me the ramifications are crazy anxiety, and constant feelings of being overwhelmed...Overwhelmed by the CONSTANT daily tasks, the cleaning, the cooking, the cleaning, the cooking, the cleaning...well, you get that point. The laundry, the whining, oh, the WHINING from almost three year old girls! The clutter, the disorganization, the fact that I don't know where my keys are, or my phone, or the phone number for my babysitter which was just on that scrap of paper that I just left on the counter, right there I swear! Alright, I'll stop, but that's what my brain sounds like sometimes, well, a lot, especially when I'm not in synch with God. So, in the last couple of weeks, as I've been sending up those mini SOS's to say, "Hey, God, I thought you said you wouldn't give us more than we can handle? And why is motherhood so stinkin' hard?" I've felt gentle nudges back that say, "Lisa, Lisa, your mind is filled with many things..." Yeah, remember that story about Mary and Martha...do read it here if you have forgotten it. God, has been sending me reminders to quit the fretting and just come sit at his feet. "Really, Lord? But, what about the..."
Sooooo. Last night I finally gave in. I had bible study with a really great group of Christian gals who are also mommies and we are reading a book about balancing our lives. The big premise is seek God first and all of the rest will fall into place. On my way home from Bible study I felt like I just needed to sit and be still and really pray to God and then just be silent...I almost gave into reading blogs and magazines and my book club book, but I reconsidered and thought I really need to listen and put God first right now. I prayed. I prayed about mommy life. 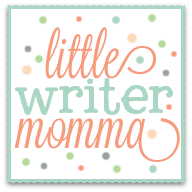 I prayed about how frustrated I feel sometimes because I enjoy writing and would love to have a thriving freelance writing business, but all identity outside of motherhood feels like it is ceasing to exist these days. I prayed about this blog that feels like it reaches hardly anyone at times. I prayed that God would bring one person to my blog who I did not know. In the end, in the silence, I felt like God said, "Lisa, you are doing everything you need to do right now. I know your heart, I know your passions. I created you. Just keep doing what you're doing and have faith that your desires are known." And guess what happened today? I decided to attend MOPS at my sister's church to check it out this morning. Since we've been back to Buffalo we've done a bit of church hopping, but have recently been attending the Chapel and LOVE it. I wanted to invest on a level other than Sunday morning, so I thought this was a good place to start. "You don't know me, but I'm a friend of Rhiannon's and I found your blog somehow through her and just wanted to let you know I've been reading it and totally relate." I don't need to get into the rest of the conversation, but truly, I almost had tears in my eyes!! God totally sent Sarah along today to encourage me and to affirm my prayers. To tell me he is here and that he is listening! It's been a LONG time since I had one of those moments. 3. And if God prompts you to compliment someone or tell them something encouraging, don't shy away. It might be an answer to their prayers. Sarah, if you're reading this, thanks again for saying hi, it meant the world today! 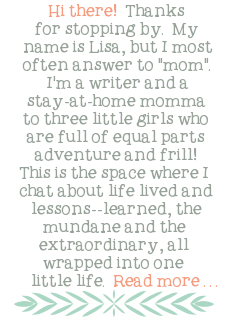 Wow lisa your post brought tears to my eyes! The truth is that God is real and present and if we just listen to what He is saying to us, great things happen. I am so glad He used me to speak to you! Honestly God has been working in my life and trying to teach me to focus in on others around me, see the person that needs a friendly hello, some encouragement, or just to be noticed in this fast paced busy life we lead. This situation gives me the encouragment I need to continue to listen to Him. Thanks Lisa! 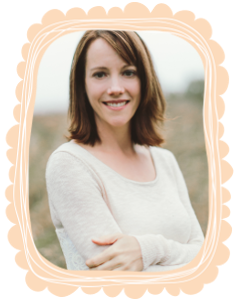 I look forward to reading about your journey as a SAHM!